This is a blog post that needs no introduction. 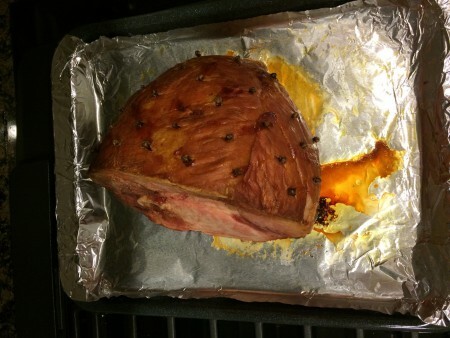 Quite simply, I’m going to show you just how easy it is to make a perfect, glazed, oven baked ham. Any objections? No? Good. Here we go. Besides steak, my boyfriend Sean would probably say ham is one of his favorite meats of all time. He hates the cold of winter, but nothing makes him happier than being able to buy a big ham from the grocery store, smother it with fruit preserves and cloves, pop it in the oven for a few hours and out comes a perfectly baked ham to warm him up. The companies like Honeybaked Ham make cooking the perfect, glazed ham seem like an unobtainable goal for mere mortals, but it’s not true. It’s actually surprisingly easy (as Sean showed me), and the amount of delicious ham that comes from it is amazing: tender, juicy, perfect. Whether you want some ham on its own as a snack, for an omelette or salad, or as the centerpiece at a gathering (holiday or otherwise) this oven baked ham recipe is the way to go. For a sweeter, glazed ham, I’d recommend using apricot preserves, but if you don’t have any preserves or just want your ham more savory, than the only thing necessary is some cloves and aluminum foil and a couple of hours. Prepare to be amazed and thrilled with your new ham-fixing-skills; it’s very impressive – and tasty. Place ham on foil lined, rimmed baking sheet. With a sharp paring knife, make tiny nicks in the ham to insert cloves. Space these nicks equally all over the ham. Brush apricot preserves on the ham before inserting into the oven. Bake the ham for 15 minutes per every pound (my ham took 1 hour 45 minutes). When ham is halfway done, baste once more with apricot preserves and then cover ham loosely with aluminum foil before finishing in the oven. Remove fully cooked ham from oven and let cool completely before slicing and serving. Tada! How easy was that? This entry was posted in Entrees, Paleo, Recipes and tagged Apricot, Baked Ham, Cloves, Easy, Entrees, Ham, Oven Baked Ham, Paleo, Recipes on January 18, 2015 by Paige N..